It’s been quite the season for champions Northampton Town as they have fairly romped to the League Two title, beating all before them and breaking records galore in the process. The Cobblers 1-1 draw at Yeovil on Saturday made it a club best 22 games unbeaten in the league, while they also set a new record of 10 straight victories as well not too long ago. Chris Wilder’s side now haven’t lost a League Two clash since a 2-1 home defeat to Portsmouth in December, as they secured the promotion that was always on the cards with a 2-2 draw with Bristol Rovers earlier this month. They haven’t taken their eye off the ball either since, remaining virtually impossible to beat, although the run of wins was finally ended, with Cobblers now drawing five of their last six games, and being held eight times in 12 matches now. All of this success has come with the club a whisker away from going out business back in November too, due to a winding up order after a £10.25m loan owed to the local council, with players and staff not being paid in that time either, which makes their achievements even more remarkable. Chairman Kelvin Thomas eventually stepped in at the 11th hour to take over from David Cardoza, and despite all the off-field issues, Wilder and his players never showed any signs of the uncertainty affecting them, as they continued to go about their business at the right end of the table. At home, Sixfields has been something of a fortress as you would expect from a title-winning side, with 14 wins from 22 games, making the 2-1 defeat to relegated Dagenham back in September all the more bizarre. The club’s players have been getting plenty of recognition for such a stellar season as well, with three Cobblers named in the PFA League Two team of the year, keeper Adam Smith, plus free-scoring midfield duo John-Joe O’Toole and Ricky Holmes, while Wilder was managed Manager of the Year at the Football League awards. Team news: Hatters captain Scott Cuthbert will probably not be risked despite recovering from his leg injury, while Paddy McCourt is back in training but won’t be considered. Magnus Okuonghae, Ryan Hall and Craig Mackail-Smith are all out for the rest of the season too. For Northampton, right-back Brendan Moloney every chance to prove his fitness ahead of the game, but top scorer Marc Richards remains out. Top scorers: Hatters: Jack Marriott (14). Cobblers: Marc Richards (18). Man in the middle: Darren Bond, has taken 34 games this season, mainly Championship and League One matches, showing 104 yellows and three reds so far. Was in charge for Hatters’ 1-0 win at Plymouth Argyle last month, his first Luton game since the 2-0 victory over Wrexham in the first leg of the Conference play-offs back in May 2012. Bond also had the 1-0 win over Kidderminster the month before that, as Robbie Willmott’s goal settled the fixture. Assistant referees are Stuart Eagland and Mark Howes, with the fourth official Nick Hobbis. In charge: Chris Wilder - 48-year-old, who had an extensive playing career with the likes of Sheffield United, Rotherham United, Notts County, Bradford City, Brighton & Hove Albion and Halifax Town, making over 400 appearances. Began his management career at Alfreton Town in October 2001, winning four trophies in his 27 weeks in charge. Returned to Halifax as manager in July 2002, racking up over 300 games at the helm until the club went into liquidation in June 2008. Moved to Bury as assistant manager, before being appointed Oxford boss in December 2008, leading the club back to the Football League via the play-offs. Resigned in January 2014 and took over the vacancy at Northampton Town, rescuing the Cobblers from relegation in his first season, consolidating last term and then leading them to the title this year. View from the dug out: Chris Wilder speaking to the Northampton Chronicle & Echo, said: “It is a great game, because Luton have had some outstanding results. “They won at Plymouth, they won at Oxford when they did us a favour on the day we won the championship, so I might have to give the manager a beer afterwards on Saturday! “They are a competitive club who will look to go well next season, and I am sure they will do that. Like a lot of the other clubs, they will regroup and go again next year. “Luton are professional, and if I was in their changing room, I would want to make sure that they perform on Saturday, in front of a vociferous and passionate travelling support. “It’s a big old club, and I should imagine their players and their manager will want to carry on the good form they have shown, especially on the road, since he has taken over. One to watch: Ricky Holmes. 28-year-old attacker has been in scintillating form for the Cobblers after making his return form injury in December. Scored in the 4-3 win at Kenilworth Road, netting 11 in 30 appearances, and has made a name for himself as a scorer of special goals this term. Started life at Chelmsford, before spells at Barnet, Portsmouth and then Northampton, whom he signed for in January 2015. Friendly faces: Luton winger Danny Green was on the books of Northampton between 2003-04, signing his first professional contract with the Cobblers. Was released though without making an appearance in 2004 and joined Nottingham Forest, before dropping down to non-league Bishop’s Stortford. Had spells at Dagenham & Redbridge, Charlton Athletic and MK Dons before signing for Luton in the summer. Played for both: Striker Sam Park had a loan spell at Northampton Town from Chelsea in the 2001-02 season, scoring five goals in 46 games. Joined Luton for a fee of £340,000 from Ipswich in 2006, before an injury-hit stint at Kenilworth Road saw him net 10 goals in 56 appearances before a loan move to Leyton Orient and then permanent deal with Walsall in 2009. We’ve got form: Luton have a pretty poor record at Northampton over the years ever since matches started out in the Southern League back in 1900. 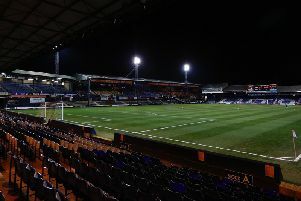 From their 40 visits to date, Hatters have won just nine, drawn eight and lost 23, scoring 38 goals and conceding 64, while they have failed to net on 19 of the fixtures played. Town have won just one of their last seven visits too, that when Stuart Douglas’ goal settled a Division Two clash back in February 2001. Last time out: Hatters were beaten 2-1 by Northampton at Sixfields last season. The visitors had moved ahead moments after the break, when Alex Lawless curled home from outside the box. However, on 64 minutes, Michael Harriman was harshly penalised in the area and Ricky Holmes converted the penalty, before James Gray netted a late winner. Hatters: Elliot Justham, Michael Harriman, Lewis Kinsella, Steve McNulty (Alex Lawless 57), Luke Wilkinson, Jonathan Smith, Alex Lawless (Cameron McGeehan 83), Andy Drury, Nathan Doyle, Paul Benson, Mark Cullen (Ricky Miller 70). Subs not used: Liam Gooch, Luke Guttridge, Ryan Hall, Jayden Stockley.